all forms known (see Bolton, 1995) . 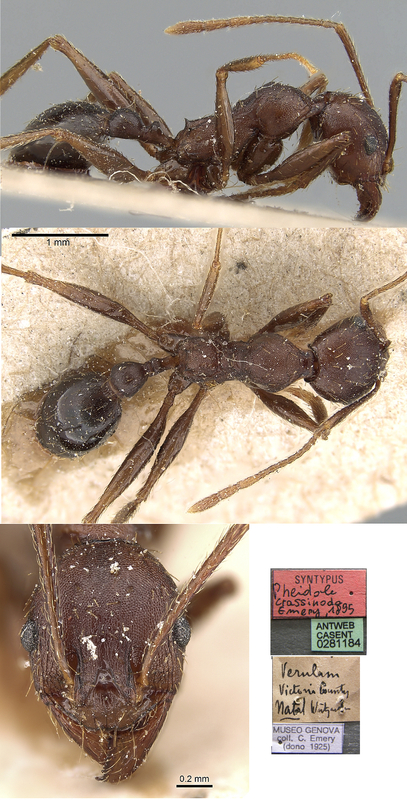 With the availability on Antweb of images of the Pheidole ruspolii type major and associated minor worker, plus sexuals, I have elevated ruspolii to full species status. An immediate distinction is the shorter scapes of ruspolii. Emery's (1895h) description is at . 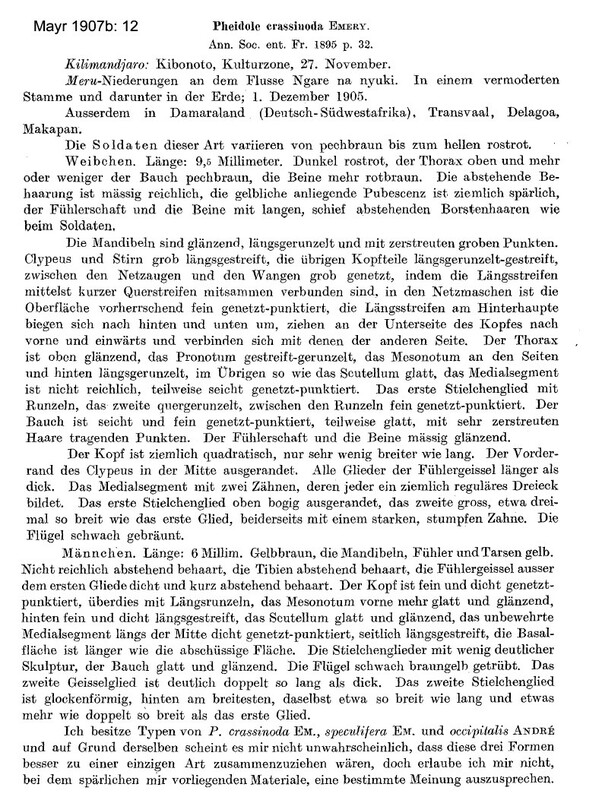 Mayr's (1907b) description of the queen & male is at . 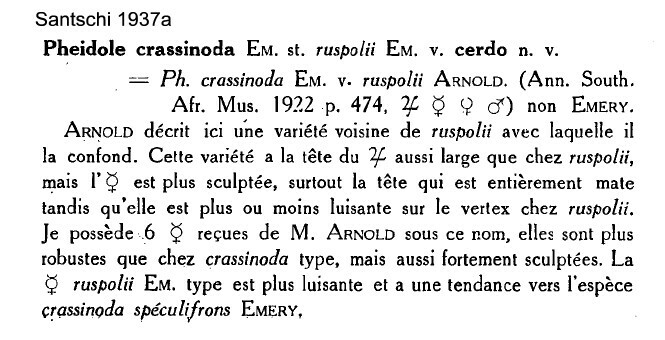 Arnold (1920a) gave a translation, this is at . 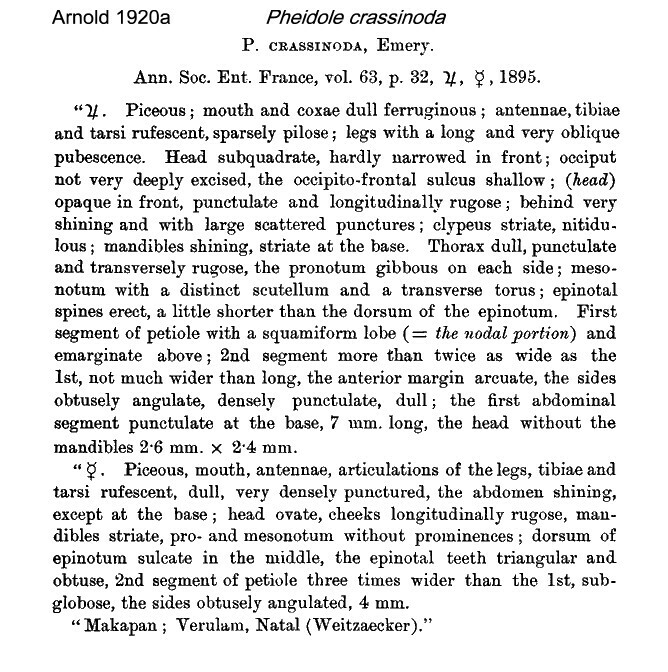 Arnold's (1920a) description of pluto is at . 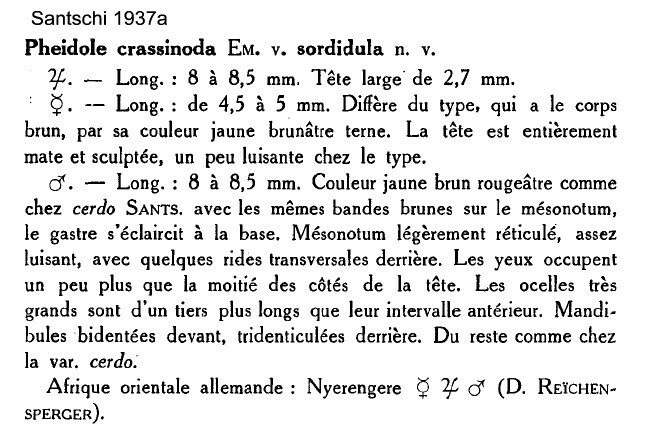 Santschi's (1937a) description of sordidula is at . 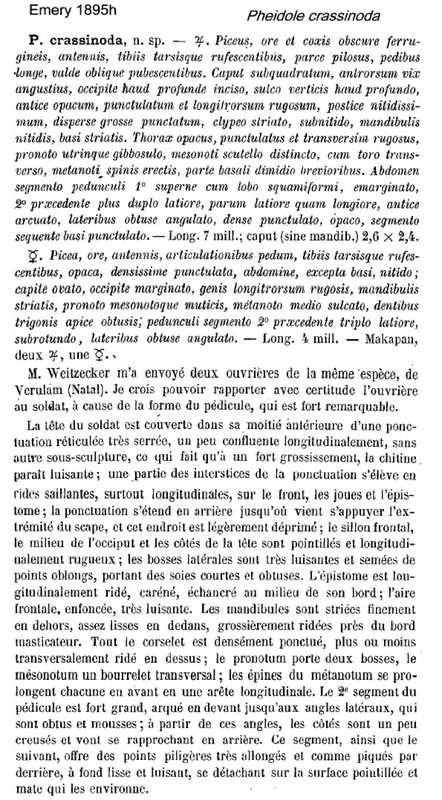 Santschi's (1937a) description of cerdo is at . 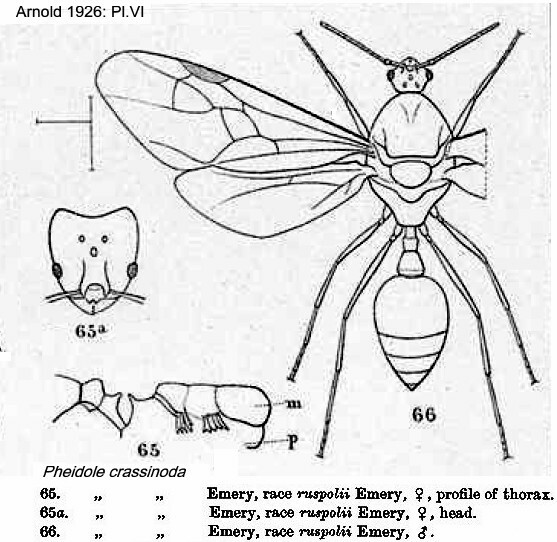 This may be an immigrant from savannah woodland, as Kemp (1951) studied its foraging activity and related how it was among the principal predators of the eggs of tsetse flies at Shinyanga in Tanzania (as Tanganyika). There it was ground-nesting. 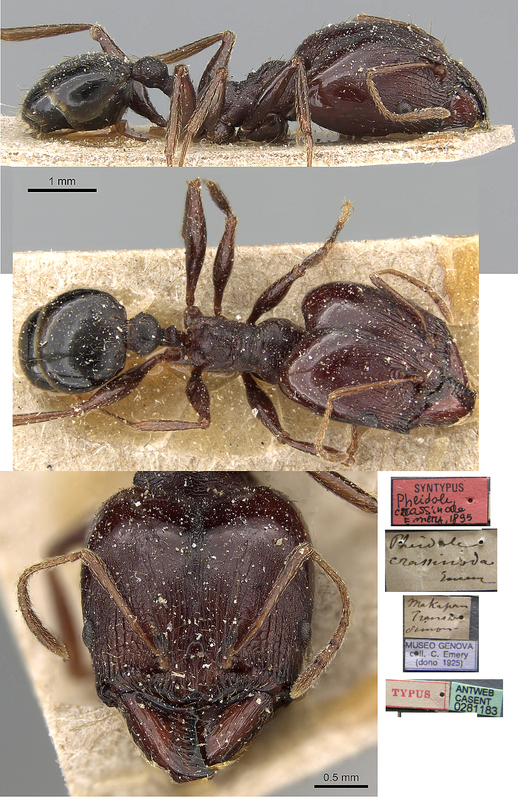 The identification had been by Donisthorpe, of the British Museum (Natural History), and Kemp noted how the workers were inseparable from those of Pheidole sculpturata Mayr. Note the head appears foreshortened in the full face view; Emery gave the dimensions as 2.6 X 2.4 mm (judging from the lateral view that is HL X HW). Npte: as with almost all Antweb images these have an over-riding magenta tint. 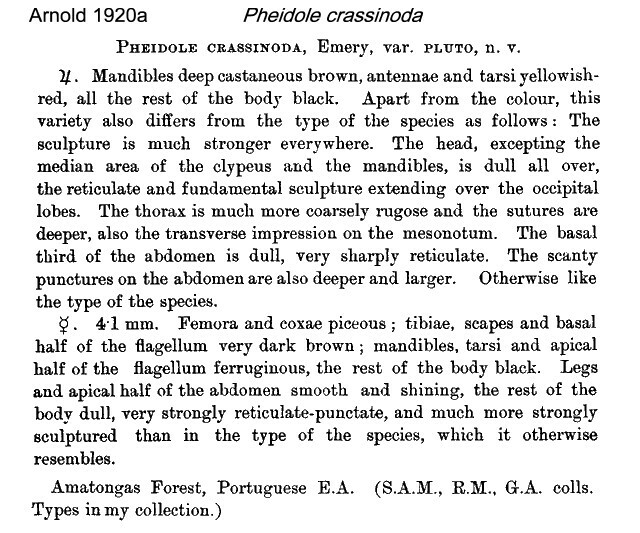 Emery described the species as piceous (very dark brown) with reddish appendages. 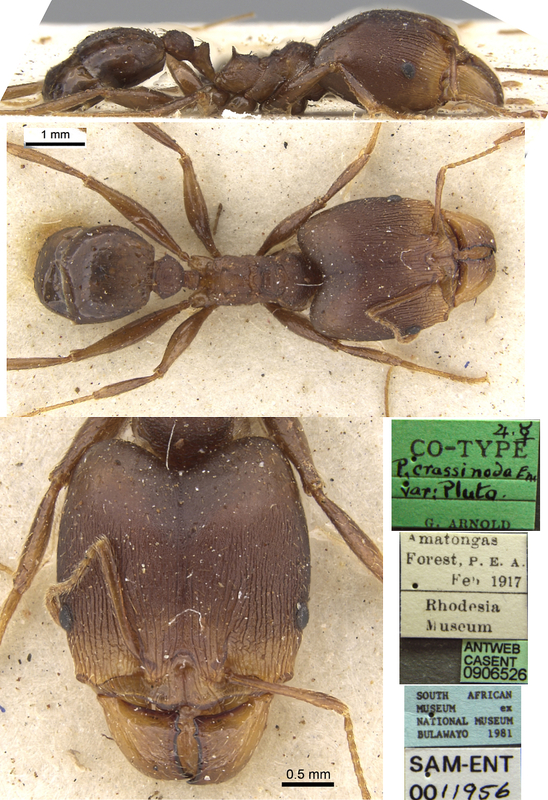 The photomontage of a syntype minor is collated from http://antweb.org/specimen.do?name=casent0281184 . Note the original colour was stated as pitch - presumably this and the specimen above have faded with time. The photomontage of a syntype major of pluto is collated from http://antweb.org/specimen.do?name=casent0906526. The photomontage is of a minor worker from Usambara Mts, Tanzania; collector Vasily Grebennikov. The photomontage is of a minor worker from Congo, Brazzaville, pitfall trapped by Yves Braet & Eric Zassi, 2007. The Sexuals from Arnold (1920a, 1926: Pl. VI).